There are few things as fun as throwing a killer housewarming party to show off your new digs — especially when you found a beautiful spot that boasts everything you need. Purchasing a new home is one of life’s biggest milestones, but when it comes to urban convenience, family-friendly amenities and the luxury of ample living space, more people are looking to Montchanin Builders’ Delaware townhome communities, where modern design meets low-maintenance living. Welcoming friends, family and neighbors into your new abode is a time for celebration and relaxation. Some of the best housewarming parties are casual affairs filled with amazing food, easy conversation and plenty of laughter. 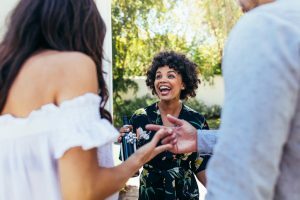 Whether you throw a themed event, a game night or a pot-luck get together, it’s an important time that can pave the way for new friendships as well. When it comes to housewarming party etiquette, there are virtually no rules. In addition to your friends, co-workers, loved ones and neighbors, why not invite your realtor too? This is a time to throw open your doors and share your good fortune with everyone! If you’re still surrounded by boxes and feeling overwhelmed, there’s nothing wrong with throwing an “unpacking party,” where guests can lend a helping hand. Simply ply them with tasty nibbles and drinks, and they’ll be happy to help lessen the clutter, plus it’s a great icebreaker for getting to know your neighbors! Who doesn’t love a little friendly competition, especially when there are delicious appetizers involved? Housewarming parties are an excellent opportunity for throwing in some games, be it the board variety or something more challenging like an interactive scavenger hunt with prizes. You can even split your guests into teams for a “design a room” challenge to see who comes up with the best decorating ideas for your new home. Let your creativity shine with a themed party that is sure to leave a lasting impression. Whether you choose a Mardi Gras celebration or a 70’s disco night, you can ramp up the fun with curated music, cute invitations, décor and costumes as well. In lieu of the traditional guest book by the door, let your guests impart their well-wishes on colorful post-it notes plastered on the wall. A modern if not whacky interpretation of this formal tradition. Montchanin Builders is proud to bring the benefits of townhome living to the people of Delaware in their elegant, master-planned communities like Darley Green. Residents become part of a vibrant community complete with retail shops, shared green spaces and a public library. These beautifully-appointed two and three-bedroom townhomes feature gourmet kitchens, high ceilings, stainless steel appliances and luxe finishes – all details that you’d be thrilled to show off! To learn more about Delaware townhomes by Montchanin Builders, or to arrange a home tour, call 302-472-7212 today.